Hopman Cup: Scoring – and the Ball Trophy Bounces Back! I didn’t get to attend the 2018 Hopman Cup in Perth this year. I tend to address or call the Hopman Cup by the year in which the Final occurs, so this year’s Hopman Cup started on Saturday 30 December 2017 but finished on 6 January 2018 the current year. I must confess that I find it easiest for me to refer to it thus as the 2018 Hopman Cup. Many others refer to it as the 2017 Hopman Cup and the fact that this tournament may span 2 consecutive years can cause confusion. If you want to get technical, the tournament that just passed is really the 2017 / 2018 Hopman Cup. To my great surprise, I noted on television and on the tournament’s website, that in 2018, the winners were awarded silver balls as their individual trophies! I puzzled “what happened to the tennis racquet trophies?” I loved those trophies along with the jewellery that was also awarded to the winners – see THIS post for more information. I know from the Solid Gold website, that these tennis racquet trophies are valued at $26,000 each. These new individual trophies were first commissioned from Solid Gold Jewellers in 2014. My research has found that these tennis racquet trophies were awarded to Hopman Cup winners where the tournaments finished in 2014, 2015, 2016 and 2017. Getting back to the wonderful diamond studded sterling silver balls, made to the real-life size of a tennis ball, the trophies are made of sterling silver, 18 carat yellow gold, and encrusted with over 200 diamonds and are jointly donated by Brinkhaus Jewellers and Argyle Diamonds. Doris Brinkhaus of Brinkhaus Jewellers says about the prestigious gorgeous diamond encrusted silver balls. Categories: Recreation, Sport | Tags: brinkhaus, Hopman Cup, solid gold, tennis, tennis scoring, tennis trophy, trophies | Permalink. Group B winners, click on the link below. You can keep the doc & and over-type to record each year’s results. It’s on again! 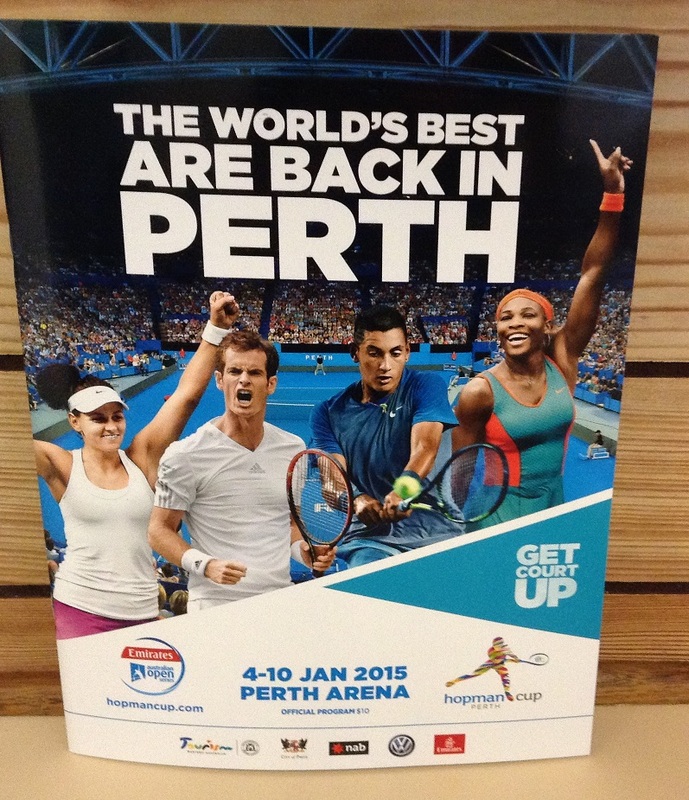 The famous Perth Hopman Cup. We Sandgropers or Western Australians love the Cup, well at least, I do. This unique tournament with its fantastic, gorgeous prizes, was first held at the Perth Arena in 2012/ 2013 and will be held at the Perth Arena in 2015. Sometimes the Cup starts in December, hence it crosses two years! The Hopman Cup tournament first appeared in 1989! The ticket prices can be seen at THIS page of the HC website, and include the cost of public transport to and from the event. This practically means you can just show your Ticket for up to 3 hours before the Session you are attending, and for up to 3 hours after, and go on the Perth trains or buses for free!! My partner and I attended the opening day session on Sunday 4th Jan. Our seats were further back along the sideline opposite where the Chair umpire sits, in Block 306, row L. We didn’t mind as we were close to the doors and under the shelter of the closed part of the retractable roof ( avoiding bird surprises on our heads – see my other Post on this Blog ). We watched the match between Canada and the Czech Republic – Eugenie Bouchard & Vasik Pospisil versus Lucie Safarova & Adam Pavlasek. Categories: Entertainment, Personal, Sport, Traditions | Tags: Hopman Cup, instax mini camera, perth, scoring, western australia | Permalink. 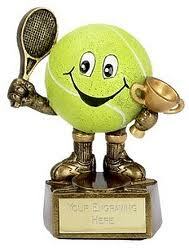 Hopman Cup 2013 / 2014 – Solid Gold Tennis Racquet Trophy Prize ! See my Post “Hopman Cup Winners 2015“ for photos of the actual tennis racquet trophies. 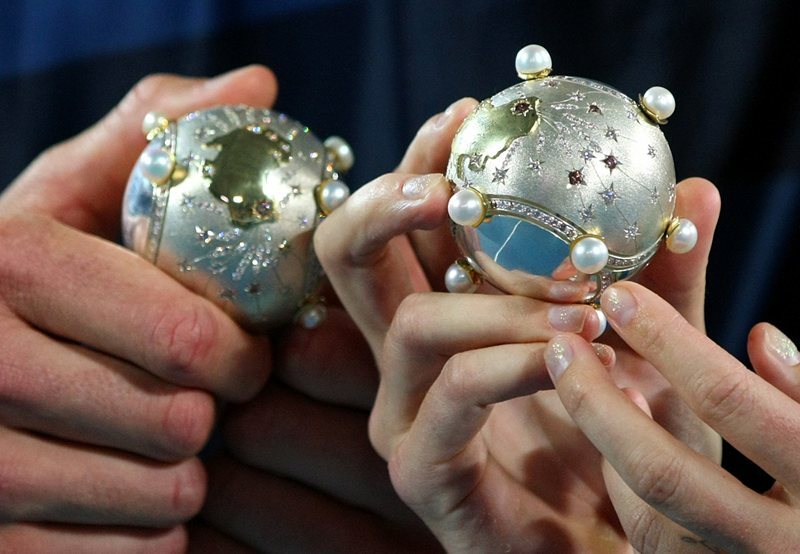 For the first time in 25 years the Hyundai Hopman Cup has revealed new trophies for 2014, which have been handcrafted by the tournament’s new official jeweller – Solid Gold Diamonds. 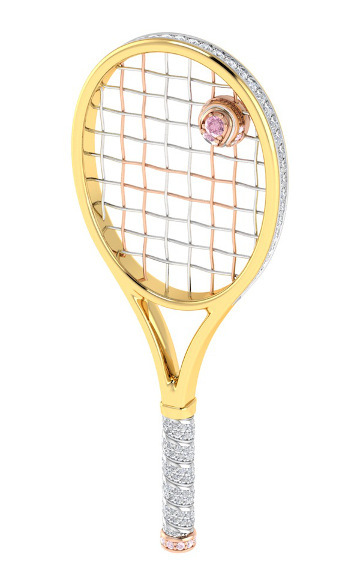 The bespoke pieces have been created in the shape of an intricate tennis racket, using just under an ounce of 18-carat white, yellow and rose gold. Please go to Solid Gold’s News page for more information. You can see the size of these trophies by looking at my post on Hopman Cup 2015 Winners. If you have trouble getting to the correct page on Solid Gold’s website, click on “News” at the top right, then on “Go to News Archive” and under the “Telethon Pendant” you will see their news article for the new Hopman Cup trophy. UPDATE @ 4 Jan 2018 – the Solid Gold News pages are no longer there, but a Google search reveals a fantastic video of how these beautiful trophies are made, in the Solid Gold Blog. Click on the link below for details about the Tennis Racquet trophies & a video of how they are made by Solid Gold crafts-men. Not only will the winning male & female receive one of these gorgeous Trophies valued at $26,000 each, but she and he will also receive jewellery designed like the trophies. Categories: Culture, Entertainment, Family, Games, Jewellery, Sport | Tags: Hopman Cup, Hyundai Hopman Cup, Lucy Hopman, Perth Arena, Solid Gold Diamonds | Permalink. The Hopman Cup is a mixed tennis competition where male and female players are on combined teams and represent their countries. Players are invited to attend, national coaches not being involved in selecting teams. The Hopman Cup consists of eight teams, which are made up of one male and one female player. Teams are split into two groups of four, with each team playing the other three teams in their group. The two teams that finish top in their group play off in the finals. Each tie consists of a men’s and women’s singles match and a mixed doubles match. All matches are the best of three sets, except for the mixed doubles. If a mixed match is tied at one set all, a match tiebreak is played to decide the final set. Play began on 29 December 2012 and ended on 5 January 2013. Categories: Culture, Entertainment, Sport, Traditions | Tags: diamond tennis ball, history of Hopman Cup, Hopman Cup, lucy fox, Lucy Hopman, Perth Arena, sport, sports, tennis | Permalink.